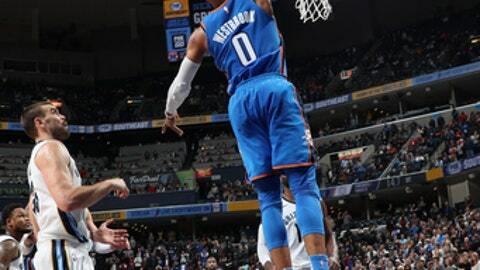 MEMPHIS, Tenn. (AP) Even struggling from the field, Russell Westbrook managed to record a triple-double, and he converted two game-winning free throws in overtime. After chipping into the 20-point Memphis lead, the Thunder still trailed 57-46 at intermission. The change of pace and a defense that allowed the Grizzlies only nine points in the third quarter, helped erase the Memphis lead. Alex Abrines, starting for the injured Paul George, made two 3-pointers in the early stages of overtime to keep Oklahoma City tied with Memphis. Abrines would match Westbrook’s 20 points to lead the Thunder – the 20 points was Abrines’ career-high. He converted 6 of 8 from outside the arc. ”We had our chances. Over and over again, we had our chances,” Memphis interim coach J. B. Bickerstaff said. ”We can’t afford to let these games slip. Thunder: George did not play because of a right calf injury. Abrines started his second game of the season. … Adams has reached double figures in five straight games. . Westbrook has eight triple-doubles on the season. . The Thunder are 3-10 on the road this season. Grizzlies: F Chandler Parsons did not play, resting on the second night of a back-to-back. … The 20-point lead in the first half was the largest this season for Memphis. … Memphis scored nine points in the third quarter, a season-low for any period this season. Oklahoma City cut into Memphis leads with strong final minutes in the second and third quarters. After Memphis took its 20-point lead in the second, the Thunder reeled off 13 straight points to get back in the game before the break. Then, in the third, the Thunder used a 12-3 run to erase an 8-point Memphis lead. The 20-point lead, the biggest of the season for Memphis, disappeared quickly, and despite hanging on for overtime, the Grizzlies again didn’t take advantage of the early performance. ”Basketball happened. They made runs,” Gasol said. The Grizzlies frustration is in full force. ”We have to figure out a way to close out these games. It’s frustrating. Hard to sleep.” -Harrison. Thunder: Face Charlotte at home on Monday. Grizzlies: Play their third home game in four days when the Miami Heat visit on Monday.